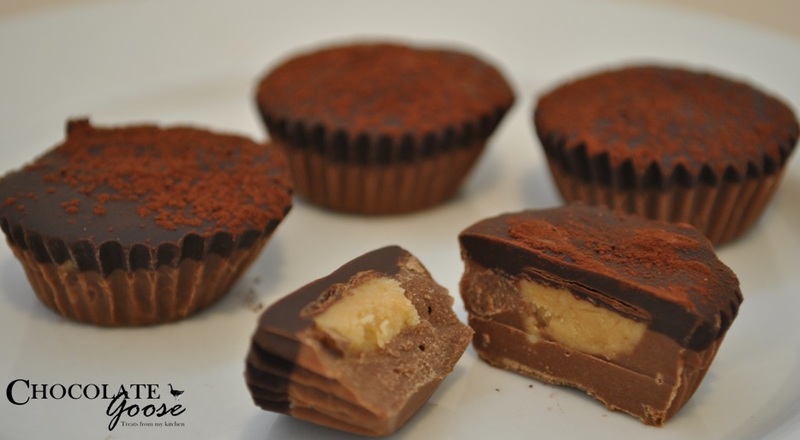 These chocolate peanut cups are to die for and anyone you share them with will think you’re very clever, but I can promise you, they are so quick and easy I think you’ll be surprised when you make them. I remember being incredibly impressed when a friend made something similar a year or so ago for a little “do” at her home, and she protested that they were indeed simple to make, but we didn’t believe her at the time as she is a genuine baking genius. I found the recipe for these tasty morsels on the back of a Sun Valley chocolate wrapper and couldn’t resist trying them out. The ingredients are pretty standard; milk chocolate, dark chocolate, peanut butter, butter, icing sugar and cocoa. If you’re not keen on a bitter dark chocolate, use semi-sweet instead or you could just use milk chocolate for the whole thing but then you’ll lose the lovely two-tone effect. The only thing you might have to source is the mini muffin/cupcake cases – and I mean the very tiny ones – like the ones you’d use to serve truffles in. They’re easily peeled off after the chocolate has set or you could leave them in the cases to add a bit of colour, but I like seeing the three layers of chocolate (including the sprinkling of cocoa on the top). With Christmas just around the corner, a few of these beautifully packaged in cellophane bags with colourful raffia or ribbon would make lovely home-made gifts or with all the school galas (fetes) on at the moment, they’d add a bit of style and charm to the tea shop or bake sale stall. I suggest halving the quantity of peanut butter, butter and icing sugar as you’re left with an enormous amount in relation to the chocolate after completing all the cups unless of course you have other ideas for this leftover mixture. 1 tsp of butter weighs approximately 4.7 g (see Traditional Oven butter converter) so if your scale is one of the old non-electronic ones you’ll probably have trouble getting an accurate measurement. If you do halve the quantities stated below, use only 3 level teaspoons of butter, 62 g (1/8th of a cup) of smooth peanut butter and a ¼ cup of icing sugar instead. Place 12 – 16 mini muffin cups (silicone, foil or paper, it doesn’t matter) into a muffin tray (supports the shape as the melted chocolate is runny and will cause the sides of the cups to lean over if unsupported). Heat the butter and peanut butter in a microwave safe bowl until soft, not melted, check every 10 seconds or so. Mix thoroughly with the icing sugar – no need to sieve it – and set aside. Melt the milk chocolate in the microwave or over a double boiler and share it among the muffin cases, filling each a little under halfway. Repeat until all the chocolate is used up. Place a tiny teaspoon of the peanut butter mixture on the top and centre of each milk chocolate case, pushing it down gently so the chocolate forms a cup around the mixture. Repeat step 3 using the dark chocolate and top up the cups until full and all peanut mixture is covered. Lightly tap the cups or tray on the counter top to remove any air bubbles and place in the fridge to cool completely and set. Once cooled, remove from the cups and dust with a sprinkling of cocoa powder – use a fine mesh sieve so you don’t get clumps of cocoa.